Whoot, whoot, we've whooshed around to almost the weekend! It may actually BE the weekend where you are! In my last post, I talked about voluptuous vellum. What can be better, right? Well, how about GOLD voluptuous vellum?! I embossed my square card using my stitched die from Lil' Inker. (It's really hard for me not to call them Lil' Stinker!) The striped gold vellum is from SU. The butterfly layer is cut using the Lil' Inker stitched butterfly die. The negative butterfly opening is covered on the back with black polka dotty vellum from a DCWV foiled vellum stack, gifted to me by my friend Greta. The NBUS sediment is from a Your Next Stamp set called, "Whatnot Sentiments Set Four." The gold adhesive balls are from Studio 112. I had some old-timey fun making my butterfly antennae out of gold wire. Remember those cute little spools of colored wire? Oh, yeah, yet another thing you acquired in every color, but rarely, if ever, use. In fact, some of you paused just then to stare off into space for a minute, thinking hard about where the heck you put those little spools ... .
Addicted to CAS: Black, white, and gold. 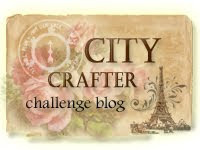 City Crafter Challenge Blog: CASE the card (below) by designer Stella. Cuttlebug Mania: We Love to Stamp. As you can see, this was super EZPZ. I made the background by simply layering strips of Washi tape. The stitched tag is from Paper Smooches. The sediment is from an old wooden stamp which is unmarked, but I'm guessing it is from one of those Hero Art 4-stamp sets. The patterned vellum is such a glorious embossed gold which I topped with v.o. ribbons. Retro Rubber Challenge Blog: Anything Goes. Runway Inspired Challenge: Naeem Khan designer gown (below). Just click on the challenge links for inspiration and details on rules, sponsors, and prizes. Renata of Renata's Creations. Renata is from Slovenia and she has been blogging since 2011. Renata makes such beautiful backgrounds for her cards. 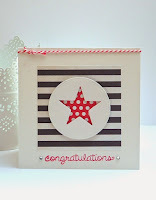 She loves clean and simple cards and has such talent for using die cuts effectively. You will enjoy visiting to see her wonderful talent! Asmah of Qinaahana Arts And Crafts. Asmah is from Malaysia and she has been blogging since 2011. She is a mother of four and very passionate about everything related to arts and crafts. Her favorite card style is mixed media and shabby/vintage. Asmah also loves needlework, home decorating, gardening, photography, and outdoor activities. As you can imagine, Asmah's energy level is high and engaging! Sue D is singer21 at Splitcoast Stampers. You can also find her on Flickr as suedflickr. Sue has been a contributor to Splitcoast since 2009! I think her cards are so pristine and so well-made. It's really fun and inspiring to see them as a full-page snapshot on Flickr. At a glance, you can see her fabulous eye for design! Sarah Mabery of Craft Nerd Creates. Yup, you read that right. Sarah is a self-proclaimed nerd in every since of the word. She holds several degrees, but Sarah also knows how to use the artistic side of her brain. She has been in love with crafting since her grandma gave her a counted cross-stitch in the fifth grade! Sarah only began blogging her wonderful cards a year ago, so please stop in to introduce yourself! Gail Townsend of Gail's Place. Gail has been blogging since 2013. She started papercrafting about eight years ago when she made a scrapbook for her granddaughter. That lead to stamping and cards and like so many of us, she was hooked! Also like so many of us, Gail loves challenges and has won many awards for her creations, which you will find to be CAS and crisp and inspirational! Reminder: I believe I am caught up now on welcoming my new followers. If you have joined lately and not been introduced, it's because I couldn't find you. If you have never left a comment or sent me an email, it makes it almost impossible for me and the Google team to find you. So, please do remember to contact me via a comment or email when you follow me. Thank you! why isn't a lemon called a yellow? Ha ha ha....love how you dressed up the butterfly in black - you make me smile! Love coming here to see what you've created, Darnell. These cards are truly gorgeous! The first one actually got a gasp from me when I spotted it! Good luck on the challenges - you're a winner in my book! Tee hee - I've been coming here so long, who knows if I was ever introduced!?! I've known Sue D a long time. She's a wonderful person, and such a talented artist! Have a great weekend, my friend! Well, missy, these are not only beautiful, but stunning and gorgeous as well! WHOA! Love BOTH so much!!!! So glad to know why I have all that colored wire now too....um...I'm just surprised Jim hasn't found it and started trying to wire something together outside! What's NOT to love, eh? Scrummy combo....LOOOOVE the wire feelers...but yeah, practically speaking!!! And washi bg's always work a treat, I reckon. As shown to perfection here;)!!! The wire antenna is amazing but the black is more practical. Love that rich vellum. I have a stash of the SU in silver. I need to use it! Love that gold tag and the Washi tape. Something else I haven't dipped into. Two gold and black beauties (or is it 3?). So glad you shared with us at ATCAS! I love everything about your first card! The design is amazing with the negative die cut butterfly with the vellum showing from behind and also making a border around it. Gorgeous! There's a whole lot of elegance going on here with the gold vellum and deep dark black!! A...may...zing as always Darnell. Have a great weekend! What beautiful cards you created with your vellum and washI. He stopped crying so just had to nick back to quickly say if they called them all by their colour then when would you know you were talking about a red or a red or a green and a green, you know what I mean!! I love how you played with your washi on the 2nd card, too...so clever, and your white bloom is perfect on Kraft! I think you've really knocked it outta the part for all of these challenges ~ Great job! Hope your weekend is off to a wonderful start! Both cards are very beautiful, but my favorite is a washitape. Very elegant cards Darnell-loving the combination of spots and stripes on the butterfly card and the golden tag card-simply gorgeous! They both look gorgeous Darnell. Your cards are stunning Darnell. I love the gold vellum and your designs are so beautiful. Lovely colors, lovely card! Thanks for playing along with us at CCCB! Loving all of the cards. 2 wonderful and superbly designed creations. I love them both, but that butterfly one is my fave, as I love butterflies. Would really love that butterfly die. oooooooooo! another to add to my very long list. Love and big hugs to you and yours. ... and why isn't a mango called a ... wait. Fab cards and I'm jones-ing over that vellum, D.
Two fabulous cards , I love the stripey gold vellum and butterfly die you used on the first one, and the washi tape on the second looks really elegant. Great designs. I love the black and gold themes - so striking. Well, what a shock that I'm kinda-sorta on time with commenting, landing in at #40 instead of my usual 90+ (which speaks to your wide popularity, btw!) LOVE your butterfly cards; holding on to the kitchen counter so as to keep from fall-down-swooning! Awesomeness! Can't wait to chat on Monday! Yahoooo! Love the gold vellum and this is a great CAS card that is just stunning! Well they are goldalicious! Gold vellum eh? Well, you are a classy gal, if frugal with your postage lol! Love all these cards, Darnell - so elegant and classy with the gold and white and black. I think my favorite may be the last one- that washi tape makes such a fabulous background! OMG, gold vellum--I'm in love! Gorgeous cards, Darnell! Love the butterflies and the washi tape works beautifully! You melted my heart Darnell!!! Gorgeous take on our challenge! Thank you for joining us this week at CCCB! These cards are spectacular. The butterfly card is truly stunning even with the gold wire antenna removed. What a great card you made with the washi. That was inspired for sure. Love them both. I understand why you had to remove it, but they look so great(on the first photo! The second card is beautiful; stunning how you combined all those challenges! Enjoy your weekend! WOW! These are as good as...well...gold (sorry, couldn't help myself). And, BTW, I know exactedactily where my colored wire is(but it did take me second to think about it)...do you think anyone out there needs some? In any case, lovely B&W with gold cards today...you certainly nailed the RIC challenge (I failed miserably). Good show, girl. Love the card for the Runway Inspired challenge...I could not come up with a card :(. Maybe next week! Wow, both your cards are gorgeous. Love everything about them. Gold and vellum, these are so gorgeous Darnell! Love both of your cards! I just received my pack of the SU Gold Fancy Foil Vellum. Can't wait to play. And yes, I do have those rolls of wire. Just came across them the other day when rearranging a drawer. Do like it for masculine cards..and will use it when I can give them in person. Really gorgeous cards and all so well created. Love the colors. YAY for washi tape! Love all the gold! Love all the black and gold, great combination. What elegant cards! I love the just-right touches for them! Beautiful!! Thanks for playing along with the Retro Rubber challenge this week. Think you have to talk to my husband about today's conundrum. He has these types of conversations all the time. And wowzers...gold, velum = fabulous! Love your cards. So much beauty to behold with B/W and gold. I think I actually own all those washi tapes you've used - thanks for the inspiration. They look great together! Love the black, white and gold - so rich and beautiful. Two gorgeous cards. Wow! These cards are both so stunning! The gold makes them look so elegant! All of the cards are fantabulous!!!! Especially the butterfly with his tux on! Haha! You are a funny girl! Love it! Oh Darnell - these are gorgeous - love vellum and must use it more :-). Thank you for your lovlely comments, and the hand is much bettet, thanks, after 3 lots of IV antibiotics, and I am now on oral meds for a week. Oh my ... Your cards are superb!! This is how I think you should use vellum!! Love each and every one! And Thanks so much for playing along with us at CCCB!! Love your combination of colors and patterns. So creative! Thanks for doing the RR challenge! Love, love LOVE these elegant cards! The tag is perfect with the washi background, and I just love the butterflies with the window in the middle. Great inspiration! Wow, love these elegant designs! Love the antennas of the first butterfly card, but I do agree the black ones are more practical for a card that will be sent by mail. It's incredible what a difference this tiny antenna design makes, like two completely different butterflies! Love the vellum and the butterfly by Lil' Inkers -- very cute card! I love it and the washi tape one, too!!! Whoot - Whoot!! Darnell I LOVE the way you cased my card. The butterfly is stunning and adding vellum adds a gorgeous touch. Thanks so much for joining us at CCCB this week!Alwats good to have you with us! Both of your gold butterfly cards are gorgeous, dear Darnell. The third one is my favourite this time. :-) Genial background of washi tapes and amazing embossed vellum! STUNNING! Really what else can I say? These are over the top amazing and beautiful. Two very lovely cards! I really appreciate you joining in on the fun at RRBC. It is so much fun looking at all the other challenges that I knew nothing about as well as visiting people I had not run across before! I hope you will visit Retro Rubber often! Both are absolutely gorgeous, Darnell! Love the layered vellum and outline stitched butterfly framing! Fabulous patterns and gold accenting on the second card, too! What an amazing drop dead gorgeous card!! The vellum is so perfect for the butterfly and also to show the contrast of stripes!! Awesome job and I thank you for sharing your beautiful card. No doubt about it...you have wooed the crowd with this stunning creation! I see that I'm not alone when I gasped out loud at first glance! Didn't stop there...had to share a "Wow" with kitty (she loves to see all the new cards posted). Seriously incredible, amazing, elegant! We will be seeing this pretty in the Winner's Circle". I really love the wire antennae! BTW, went searching - found my stash of colored wire downstairs on Danny's workbench! Turns out he hasn't used any of it either! "Oh for Pete's sake"...(wonder what that really means??? ), I forgot to comment on your second card! Awesome mix of Washi tape and gorgeous patterned vellum! Nice touch with a bit of gingham paired with the sheer ribbon! Darnell, I love these cards!! Just stunning. 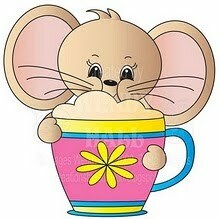 I want to call them Lil'Stinker too :-) Glad it's not just me! Pity you had to remove the antenae for mailing. The black ones look nice too. All of the cards made me good dizzy in my head. I keep seeing all of the designs with the bold gold, and I just love it! You have created exceptional cards, Darnell. Gator says hi! Wow what a a great combo...gorgeous card. Need to try vellum with gold. That combo of colors has inspired you! GORGEOUS cards, Darnell! Lovin' the gold, black, and vellum! Your cards are GORGEOUS!! So very stunning and elegant, love , love the colors together! Lovely as per usual Darnell! Gorgeous cards Darnell! So elegant and pretty. Wowsa! This stunning - a stop dead in your tracks and look again stunning! Thank you for joining us at Retro Rubber!! Wow two stunning cards. My favourite color combo... and you just whipped two elegant beauties there. Hugs. Both cards are so elegant and beautiful Darnell! Love them both so much! 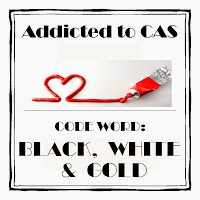 Thanks for sharing with us over at Addicted to CAS! It looks like you have a wonderful supply of vellum and washi tape - and you know how to use it. Wonderful cards, Darnell. You are really on fire, girl! Catching up on your blog & my goodness your cards are wonderful! I especially love the butterfly card--stunning! Gonna have to use some of my wire for antennae even though the hemp I used for my last butterfly is better for mailing. Beautiful cards, but I really love the butterfly card the most. I love the SU! gold striped vellum, it really makes a statement. Thanks for sharing your talent with us @ Cuttlebug Mania - Stamping Challenge. Such wonderful cards and love your sense of humor! Those us that have been collecting for awhile have a Hero Artsset or two or three or . . . Thanksfor stopping by at RRBC! These cards are all wonderful. What a great color combination. Hooray! I love the way you used washi tape!!!! Your butterfly card I amazing!!! !